When cruising, comfort and maximum use of space are vitally important. With an Aft Canopy fitted, full use can be made of the cockpit area, even when the weather is inclement. All our canopies are bespoke constructed using either coated Marine Acrylic or PVC fabric, both available in a wide range of colours. The design and specification of each order is discussed in detail with the client or boatyard. Construction sheets are completed to ensure all requirements are met. On board plastic patterns are taken to guarantee accurate production of the covers. High quality, UV resistant window material is used as standard. This should not crack or cloud under normal use. On completion, all canopies and biminis are fitted to the boat, unless distance prevents it, in which case fitting instructions will be supplied. All fittings used are either stainless steel or nickel plated brass. When appropriate we will reuse existing boat fittings. 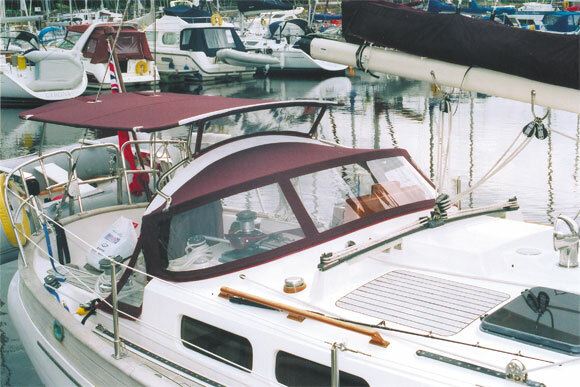 Stainless steel framework is designed to suit the bimini and/or canopy requirements. Large frames can be jointed if required. A well-designed structure is essential for successful results. The roof structure of a bimini cover must be drum tight to avoid the fabric panting when underway. Aft canopies are usually joined to the new or existing Sprayhood with a zip fastener. The side and aft panels are fitted with windows and doors. Zips allow the doors to be rolled up and secured. The frame pocket is zipped for easy removal and reinforcement is fitted at all chafe points.